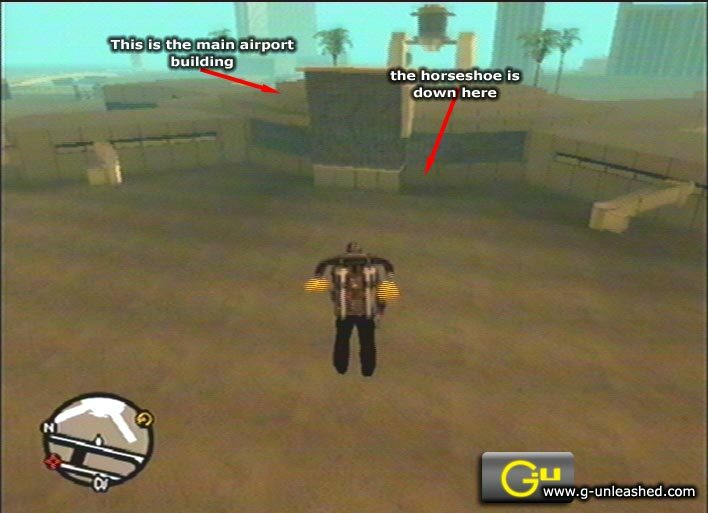 GTA: San Andreas Horseshoe Guide. Photos 1-25. 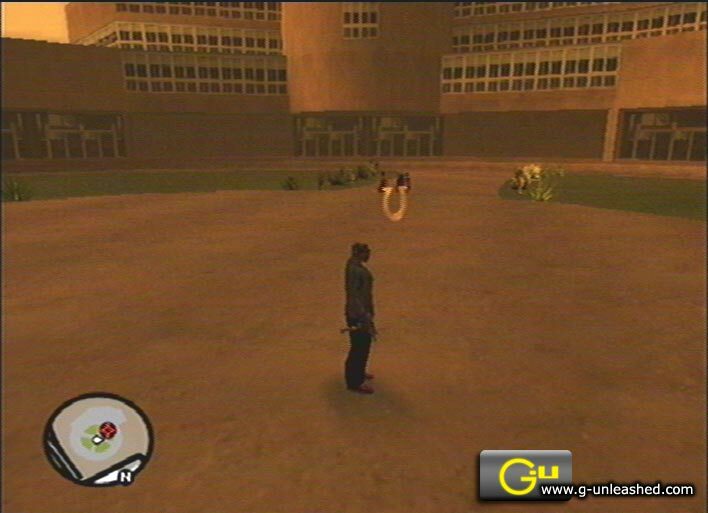 1 Location: - This shoe is in the middle of the cross/circular garden at the front of Greenglass College. It's pretty easy to spot on the radar so this should be easy to find. 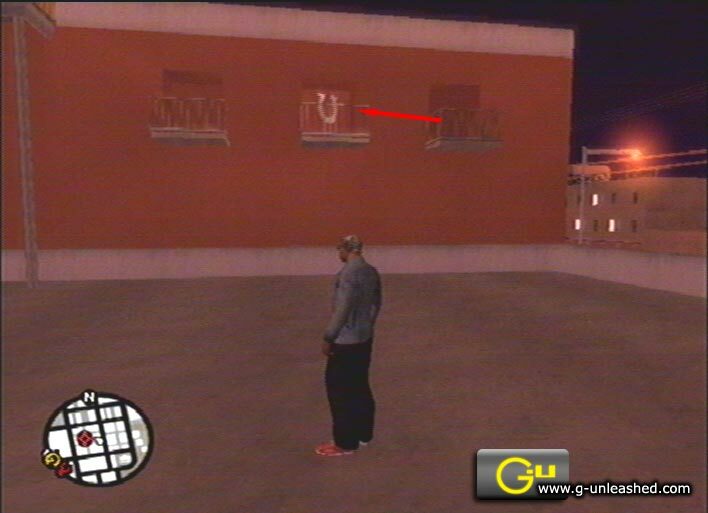 2 Location: - This horseshoe is around the back of a yellow signed 'sumo' building in the LVA Freight Depot. 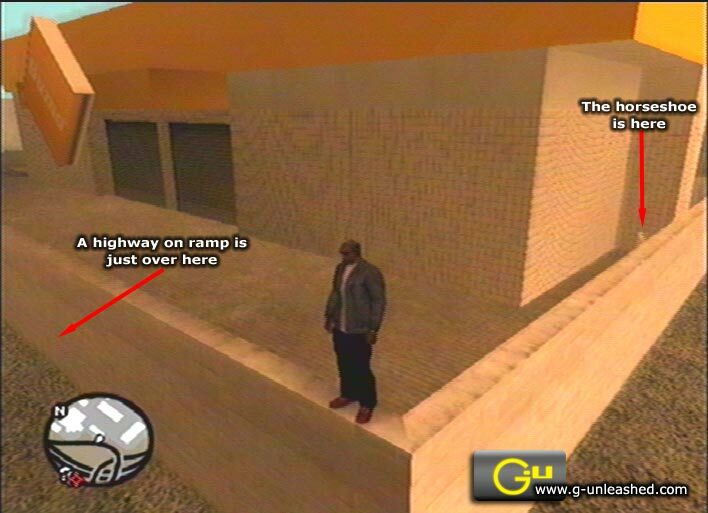 It is very close to a highway on ramp. 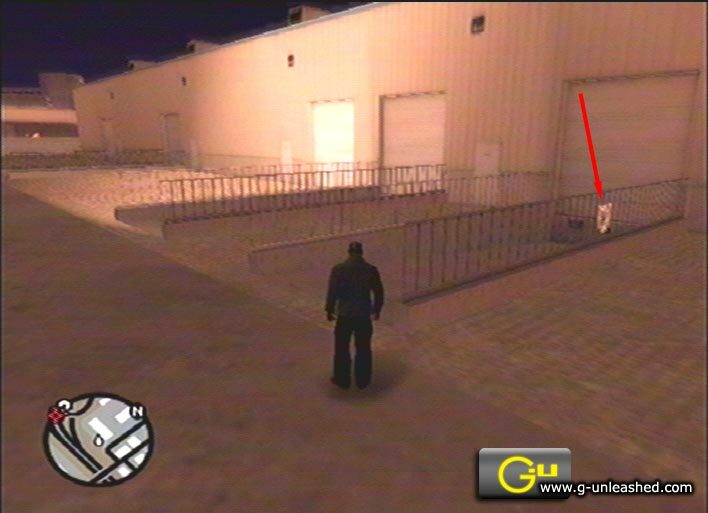 3 Location: - This one is also in LVA Freight Depo at the back of the south western warehouse in the depot. 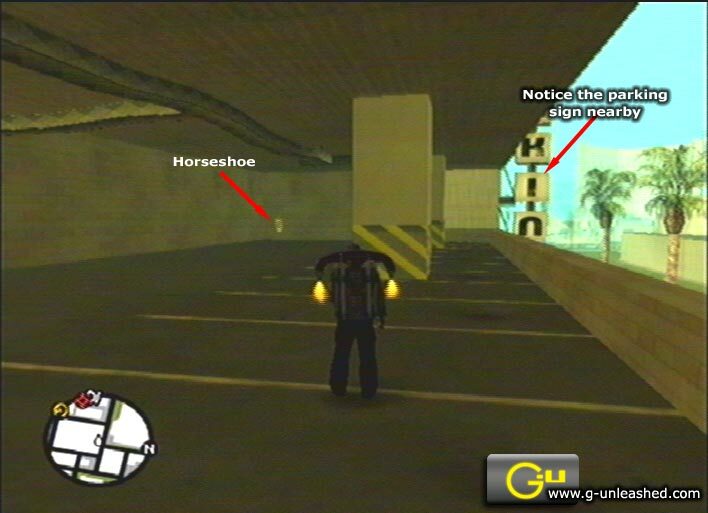 The horse shoe is in the south east ramp to the warehouse. 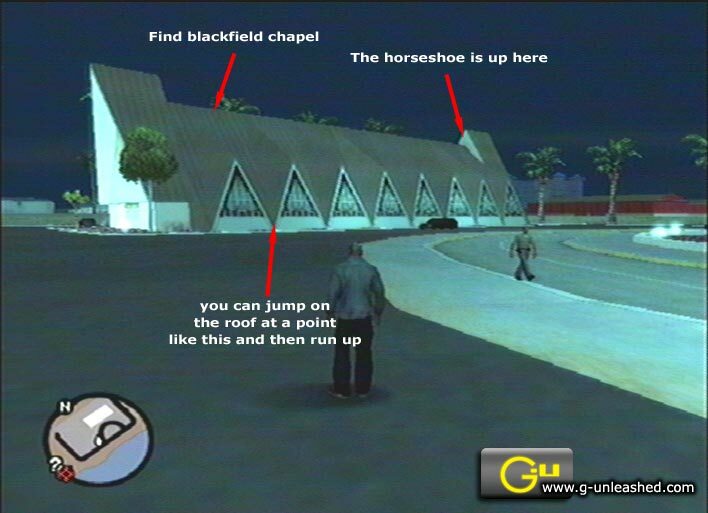 4 Location: - Find the blackfield chapel, using the map and screenshots, and then get on to the rough by jumping between the windows. 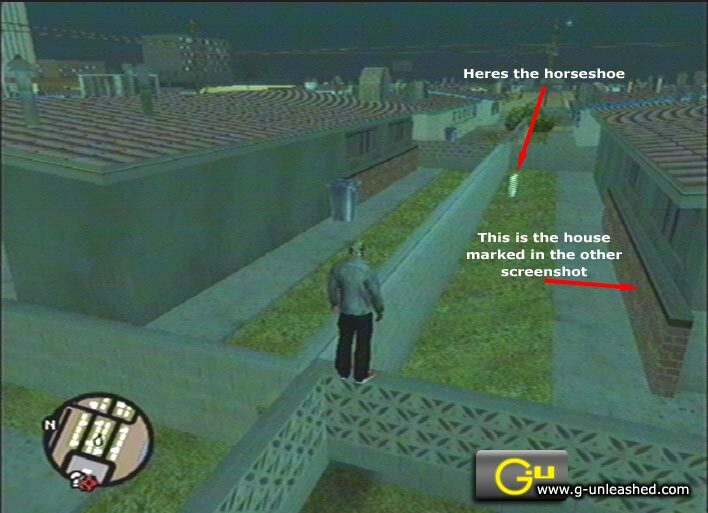 Once onto the roof, you can run up it to the top and then along to the east end to find a horseshoe. 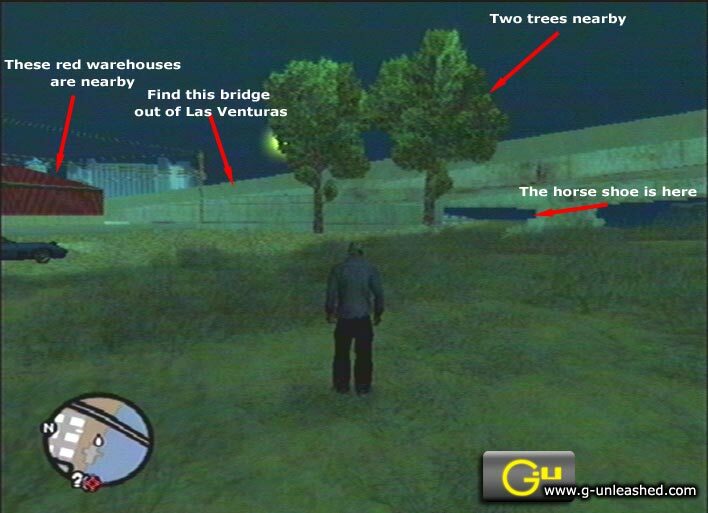 5 Location: - Find the 'Mako Span' which is a bridge from the Randolph industrial estate in Las Venturas, to Red county. 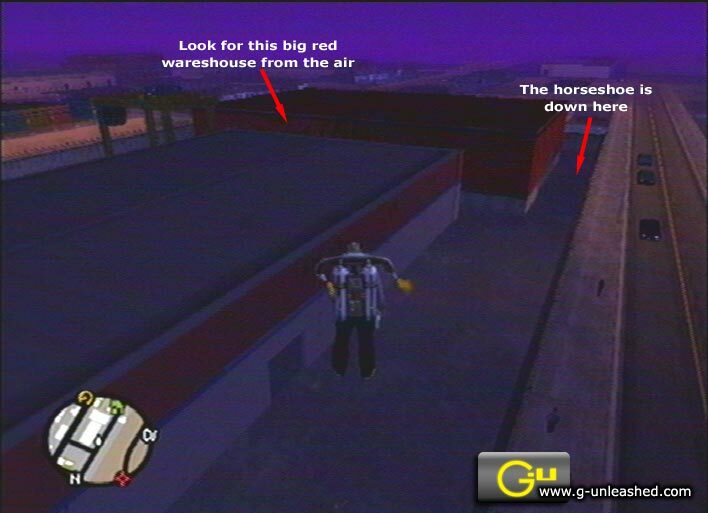 The horseshoe is under the bridge at the north end, next to two trees and some red warehouses. 6 Location: - This horseshoe is in the backyard of a green coloured house in Rockshore west. 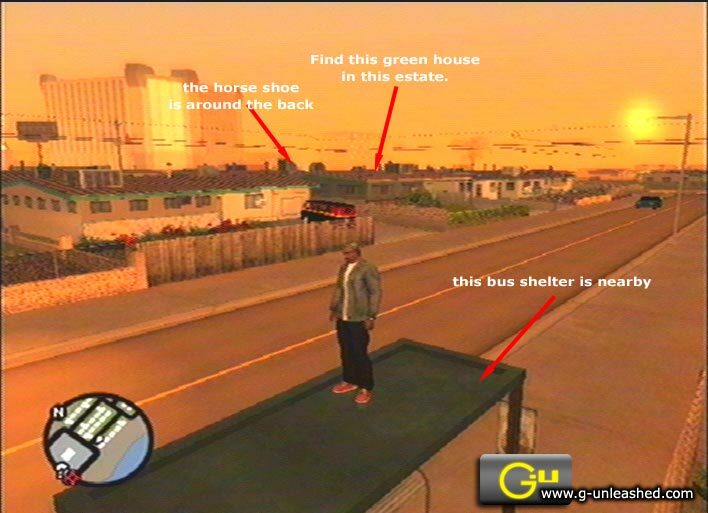 Now there are a few green houses in this area so i'll explain it a bit better. This greenhouse is in the middle of the block of houses east of the last dime motel. 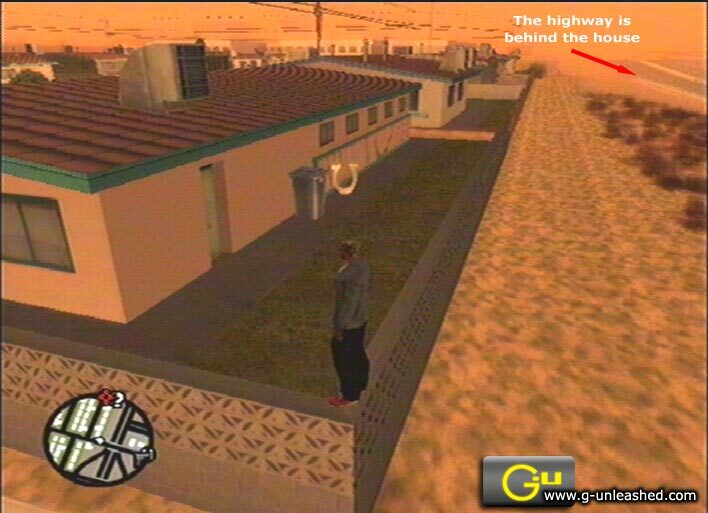 You can see the motel on your in-game map. Just locate the block and go to the middle of it and you should be able to spot the horseshoe. 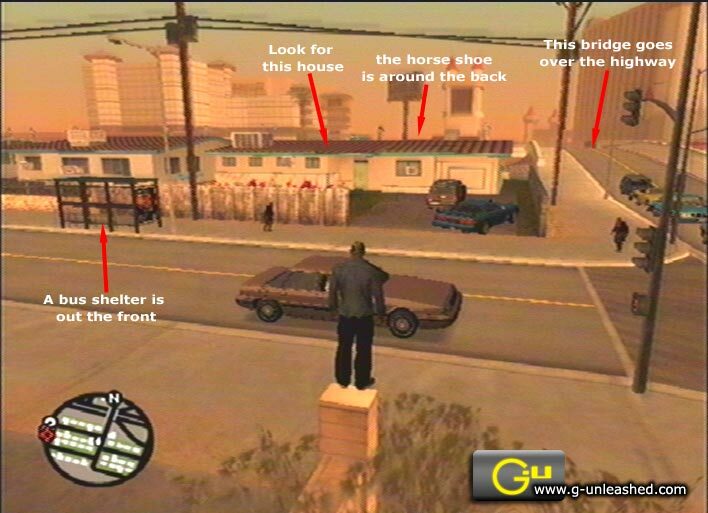 7 Location: - This horseshoe is in the backyard of a house in the block east of the Last Dime Motel. It is at the east end of the north row of houses in this block. The highway is directly north of it and it's very close to a road bridge that goes over the highway to Come-a-lot. 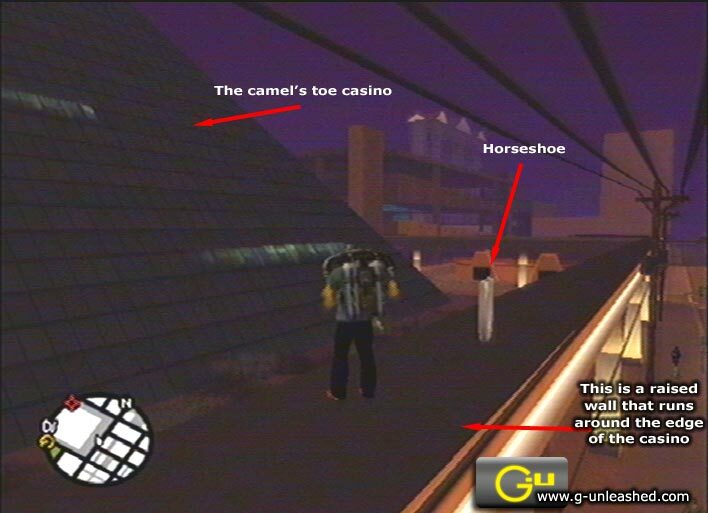 8 Location: - This horseshoe is on the 1st floor roof of the Four Dragons Casino. 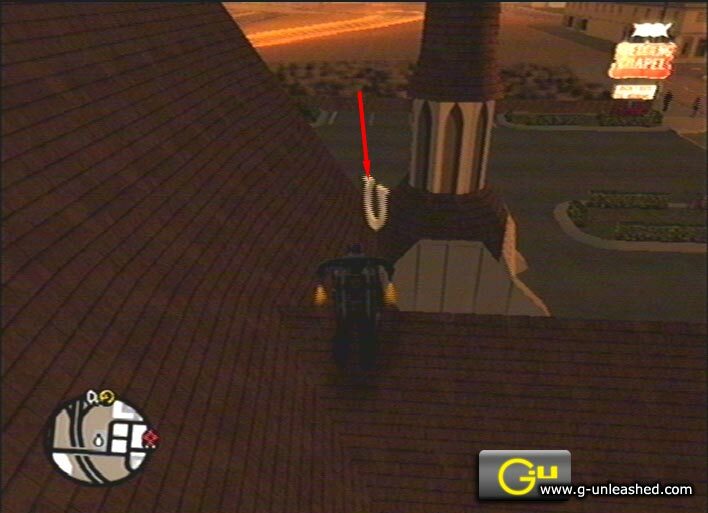 You will more likely have to get a helicopter to be able to get on the roof, but then you might find another way. 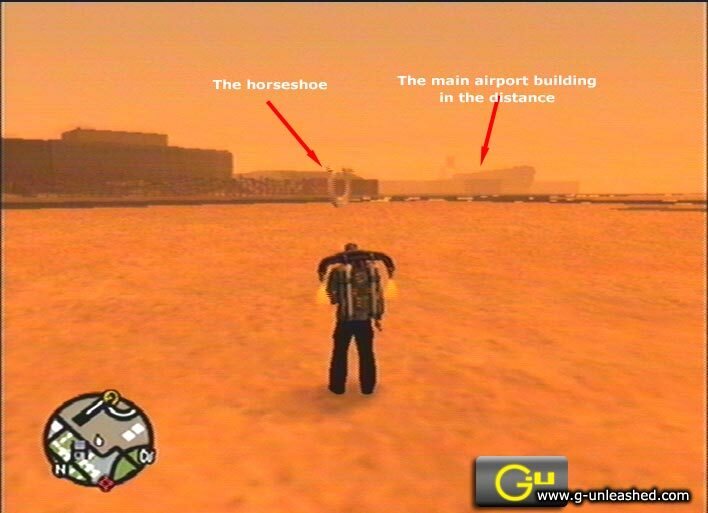 9 Location: - To get this horseshoe your either going to have to get the jetpack or risk losing a bit of health. 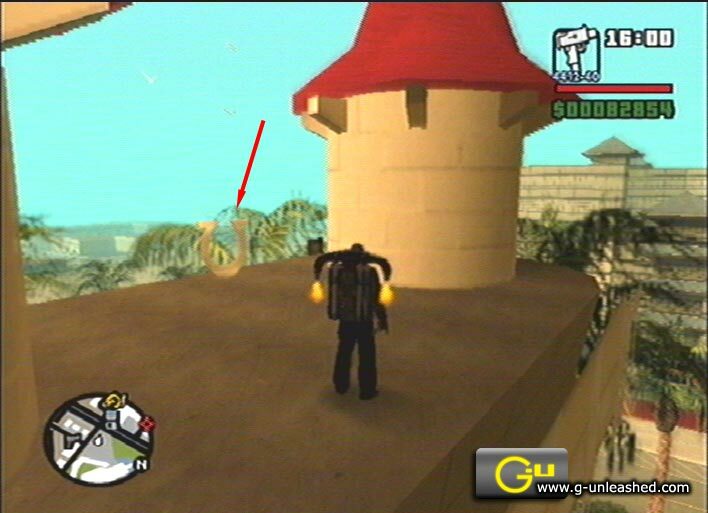 You see it's right at the top of the Come-a-lot entrance sign pictured in the screenshot, and it's impossible to land a helicopter up there. 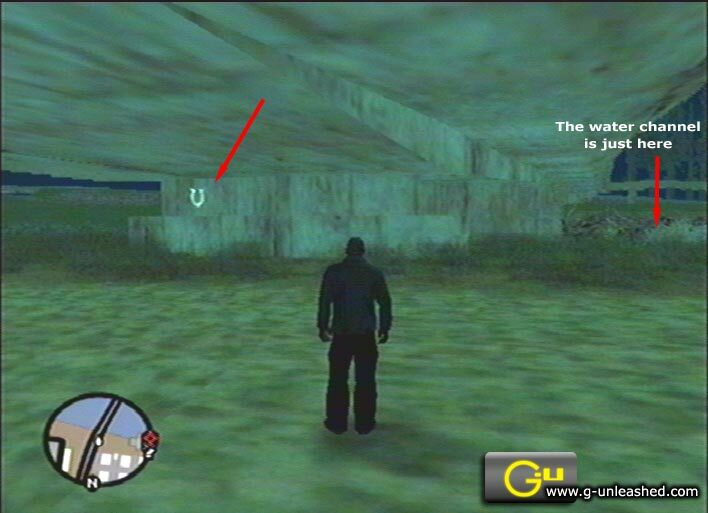 So either get a helicopter, position yourself over the sign and jump out. 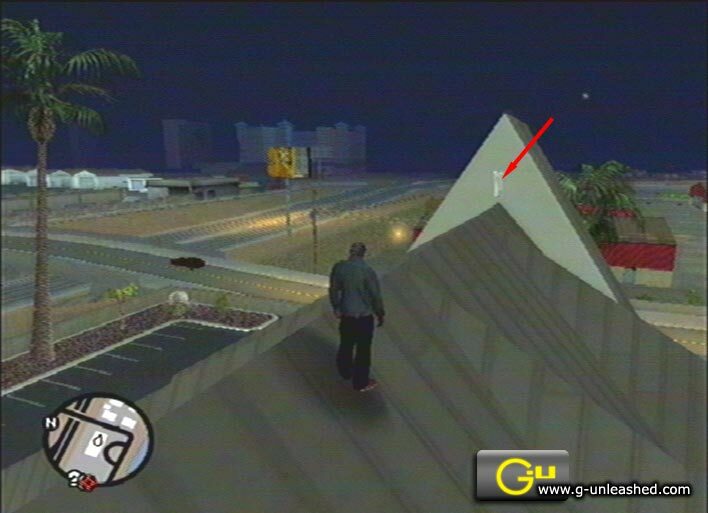 You risk falling to your death though. 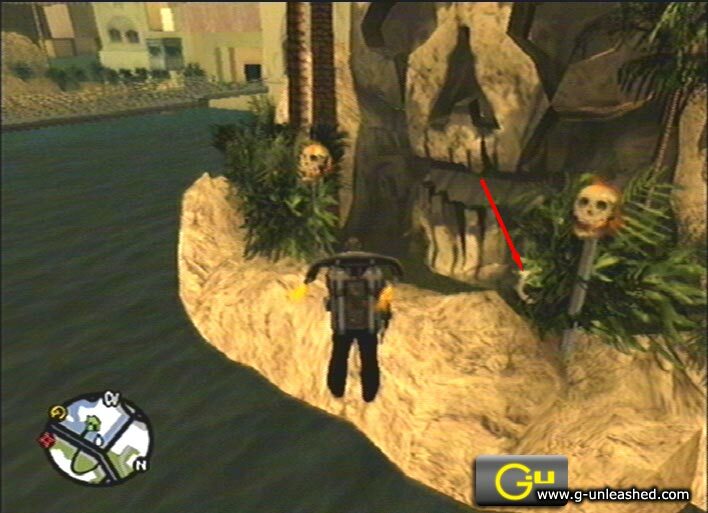 The easiest way is to just get the jet pack (available after you complete the mission 'green goo' at the verdant aircraft graveyard. 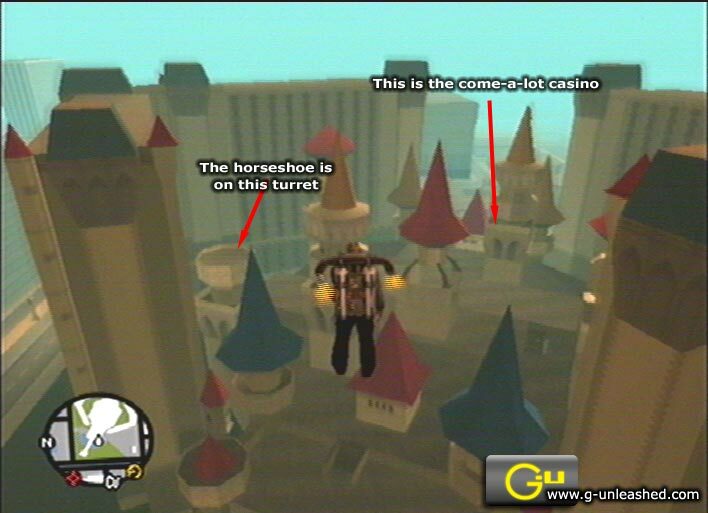 10 Location: - Right in the middle of the the Come-a-lot casino, there are lots of turrets and towers. The horseshoe is on the top of one of the northerly turrets. 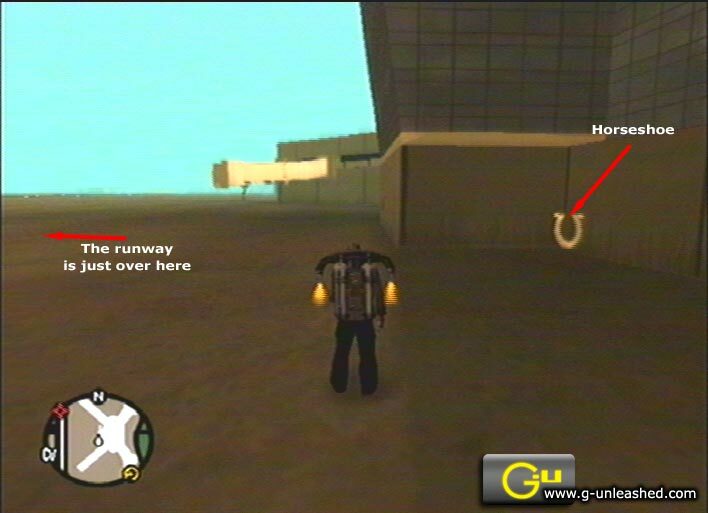 You can land a helicopter on it, but it's easier with the jetpack. 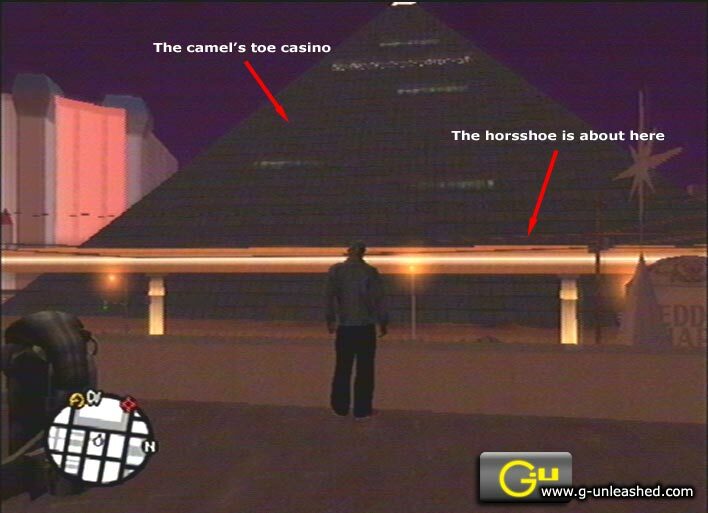 11 Location: - This horseshoe is at the top of the pyramid that is the camel's toe casino. 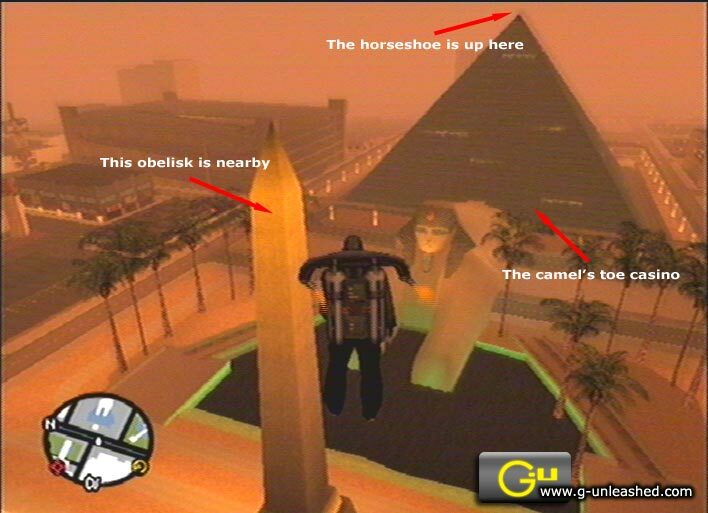 You can easily run up the side of the pyramid to the top or use the jetpack. It's up to you. 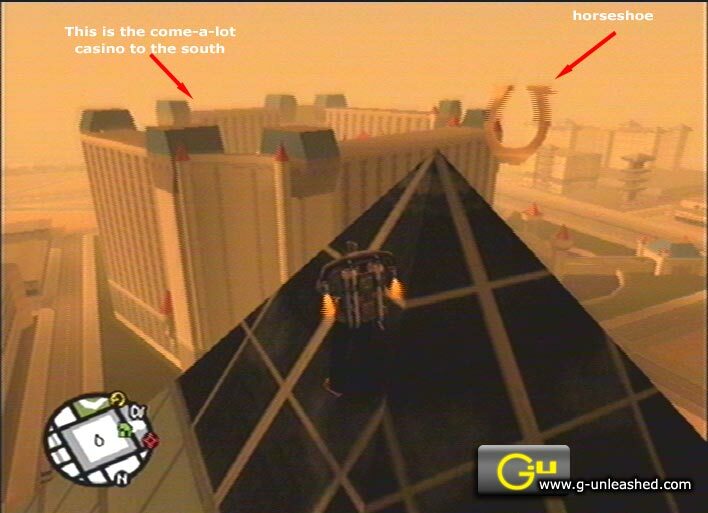 12 Location: - Around the perimeter of the Camel's toe casino, runs a raised wall on pillars. 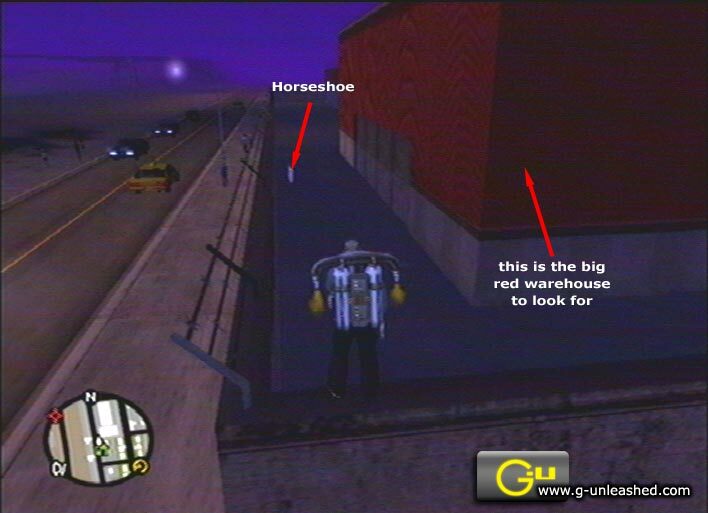 The horseshoe is about halfway along this raised wall on the east side. 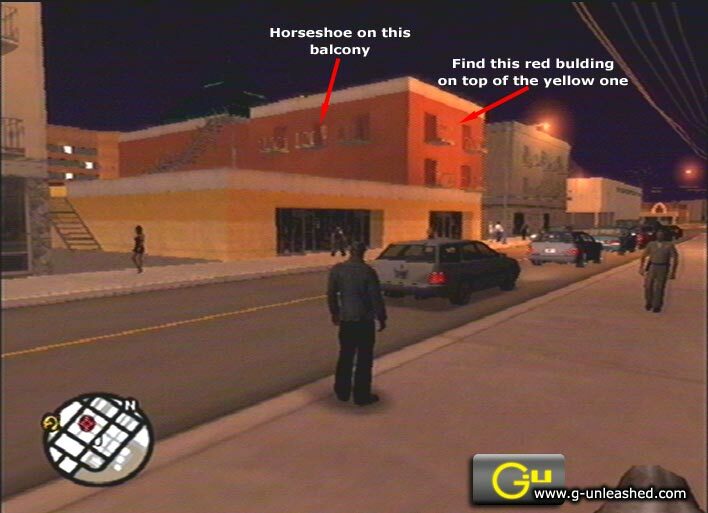 13 Location: - You need to locate the red and yellow building with the balcony's. 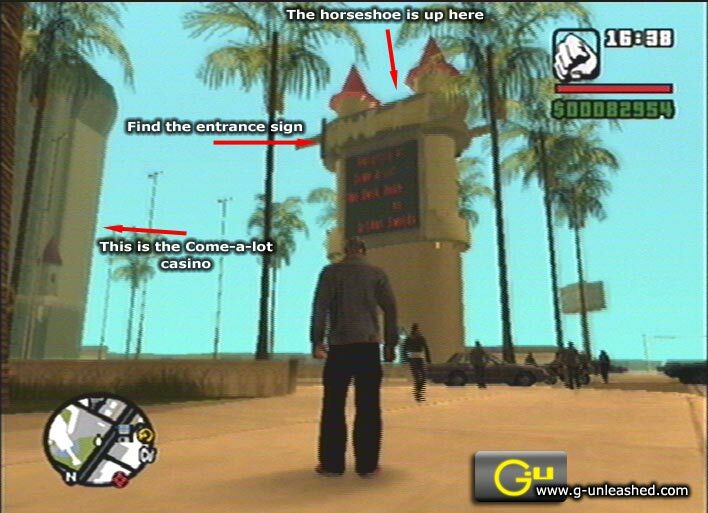 It's a couple of blocks east of the Come-a-lot casino. 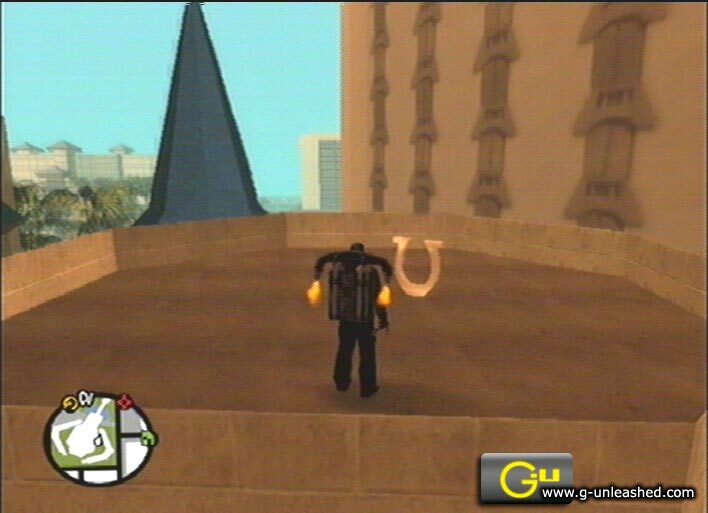 You will need the jetpack once again to get up to the horseshoe on the middle south balcony. 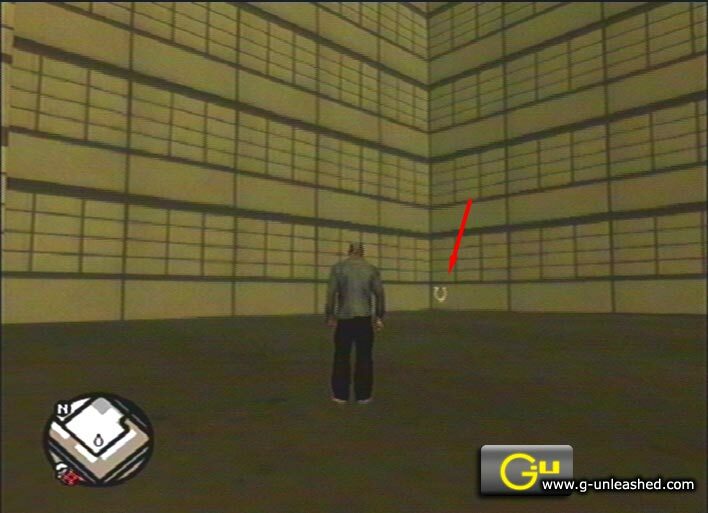 You can even go in the building which you are not supposed to do. 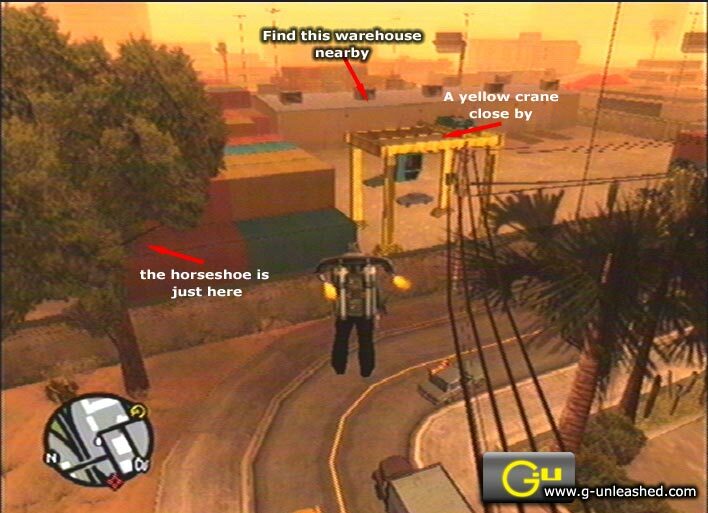 15 Location: - This horseshoe is in a skip/dumpster at the back of a wareshouse in Rockshore east. 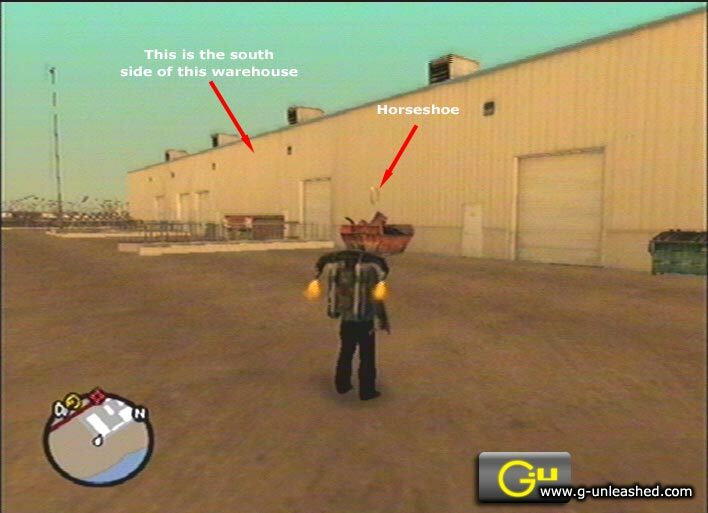 The horseshoe is at the south side of the factory. 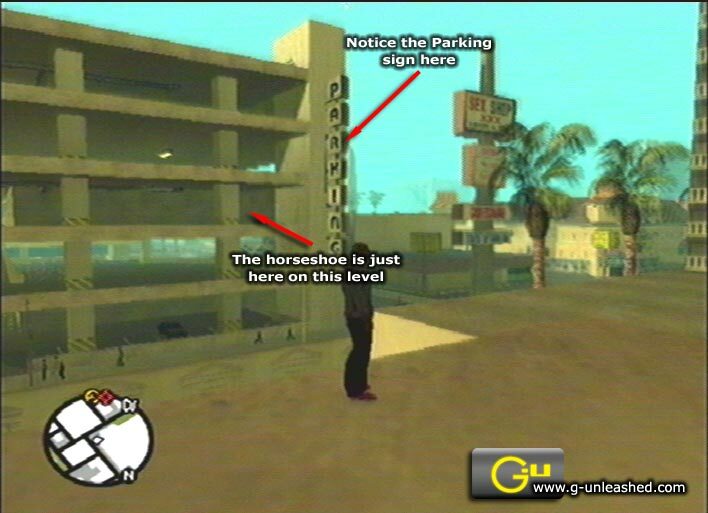 16 Location: - Find the multistorey carpark a block east of the Royale Casino. 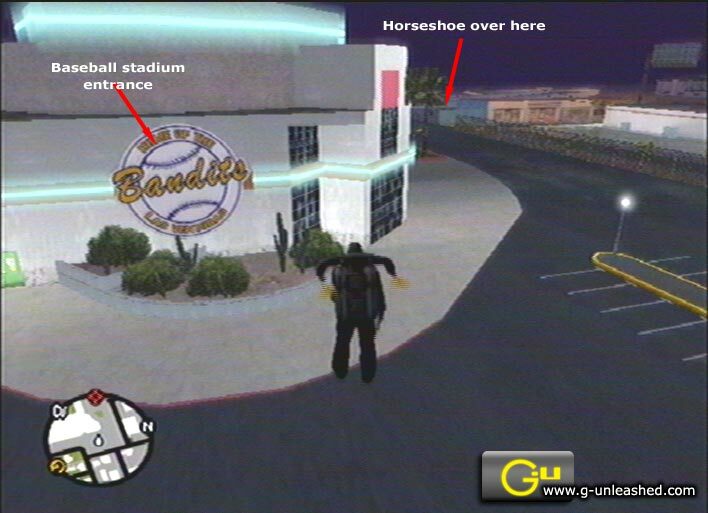 The Horseshoe is on the 3rd level very near the large Parking sign on the side of the carpark. 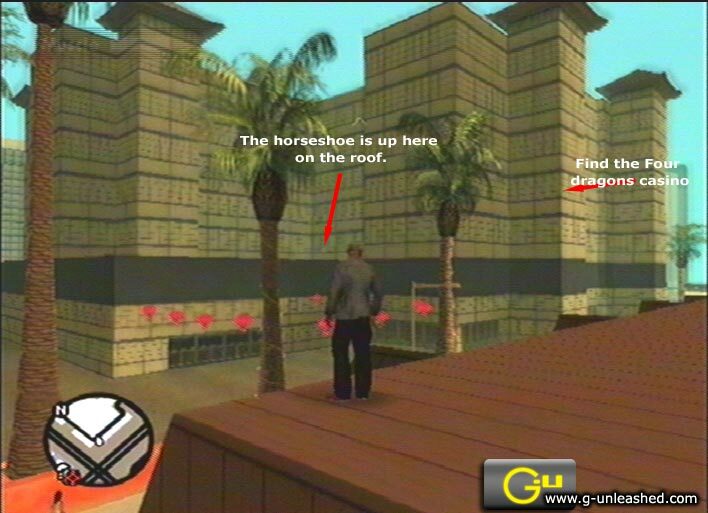 17 Location: - This horseshoe is tricky to see although fairly easy to find. 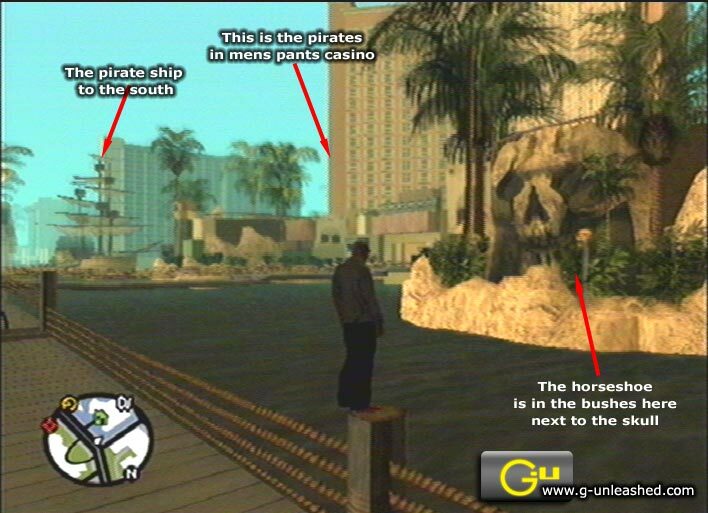 Go to the Pirates in men's pants casino, that's the one with the pirate ship out the front. 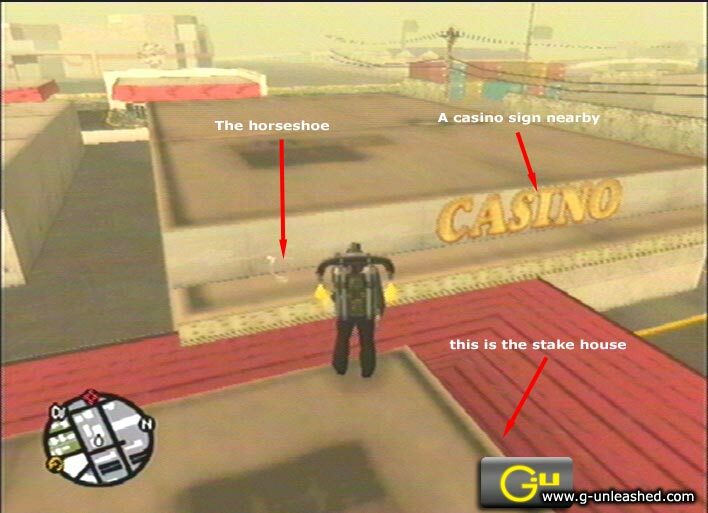 Go to the skull statue at the north east end of the casino and you will find a horseshoe in the bushes just in front of the skull. 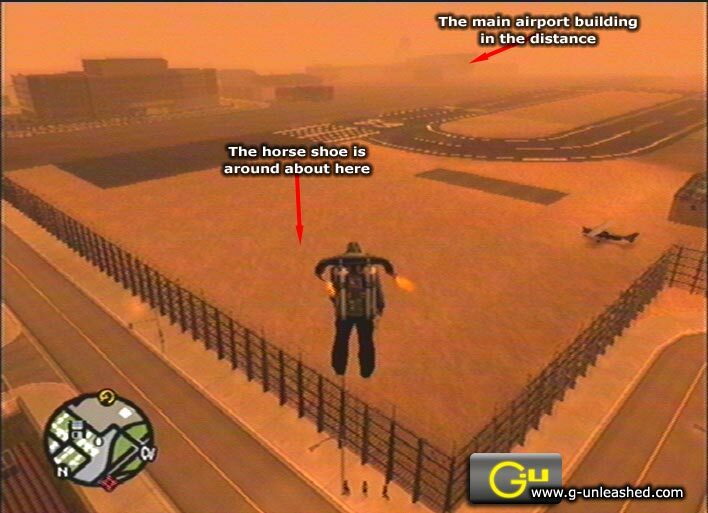 18 Location: - Locate the airport and you will find this horseshoe beside the main airport building on the west side in a corner. It is on the west side of the main airport building. 19 Location: - This horseshoe is beside the runway near the north end. 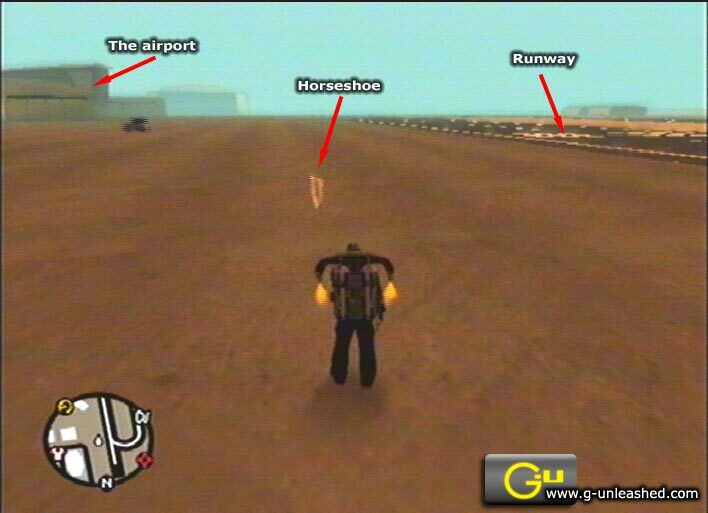 It is east of the part of the runway that curves around to join the other runway. 20 Location: - Go to the north west end of the airport. 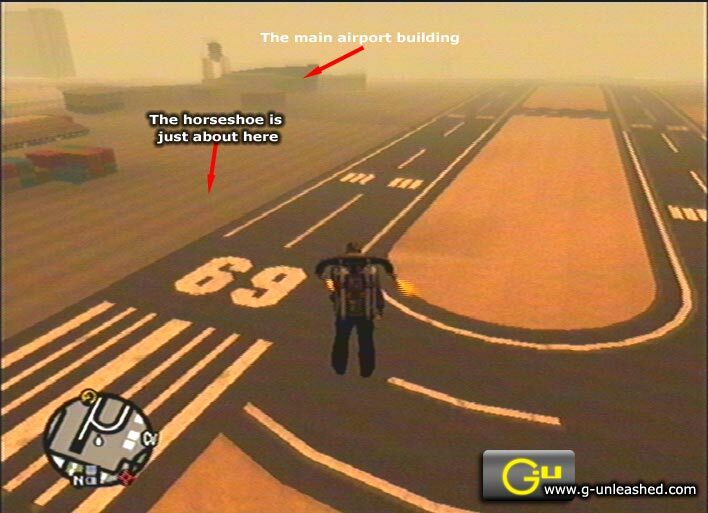 In a space between the runway end and the outer perimeter fence of the airport, you should find the horseshoe. It's tricky to see in certain light conditions, but keep looking. 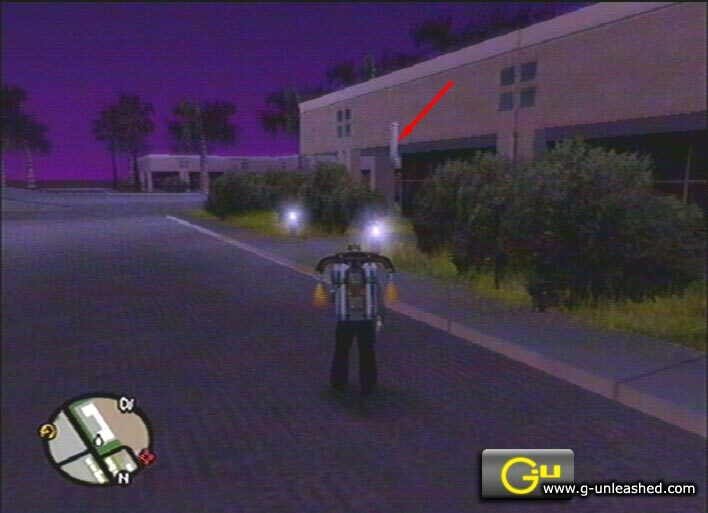 21 Location: - Find the 1 level building in whitewood estate that looks like a stretched C on the radar map. 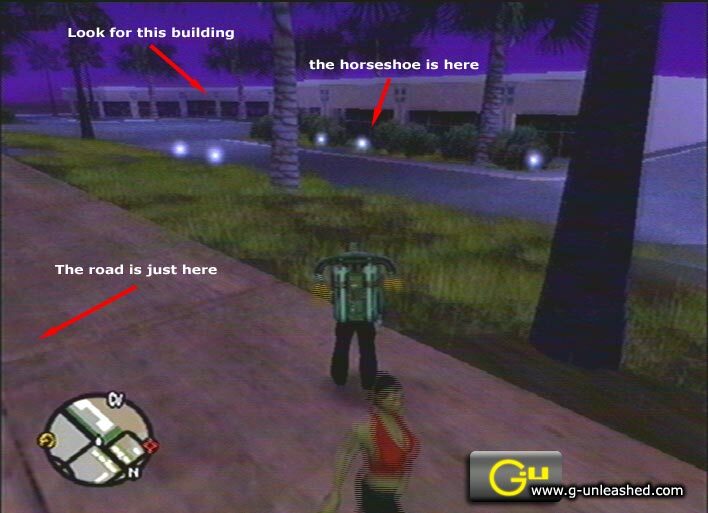 The horseshoe is out the front at the north east end of the building. 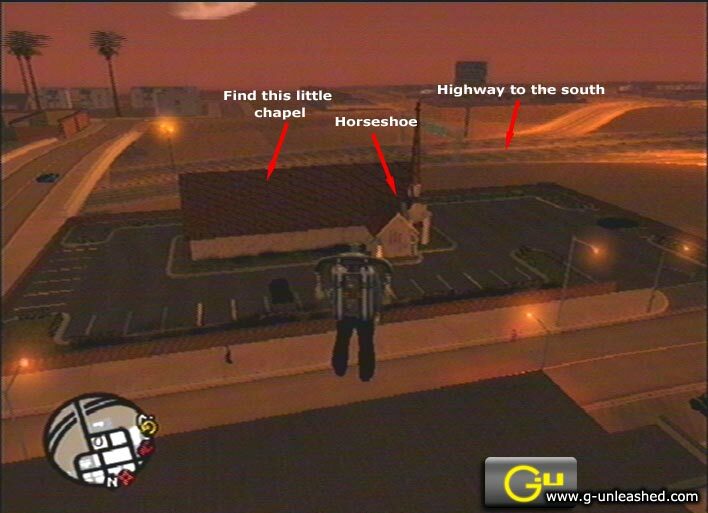 22 Location: - This horseshoe is between a big red warehouse and the wall in whitewood estates. 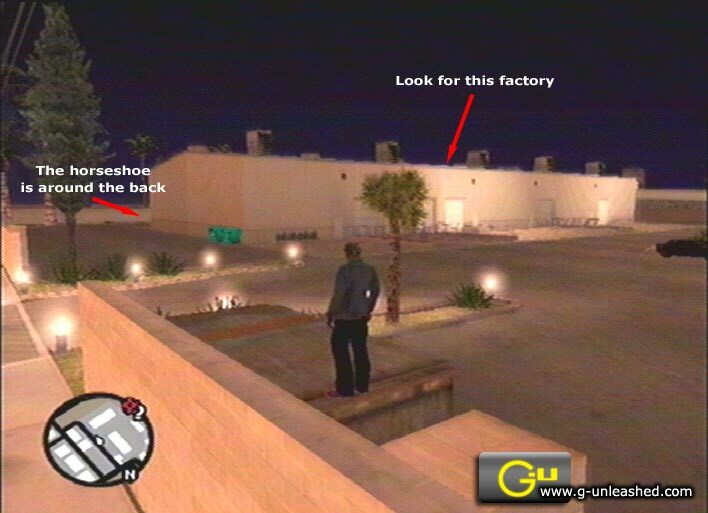 It is at the south west end of the warehouse. 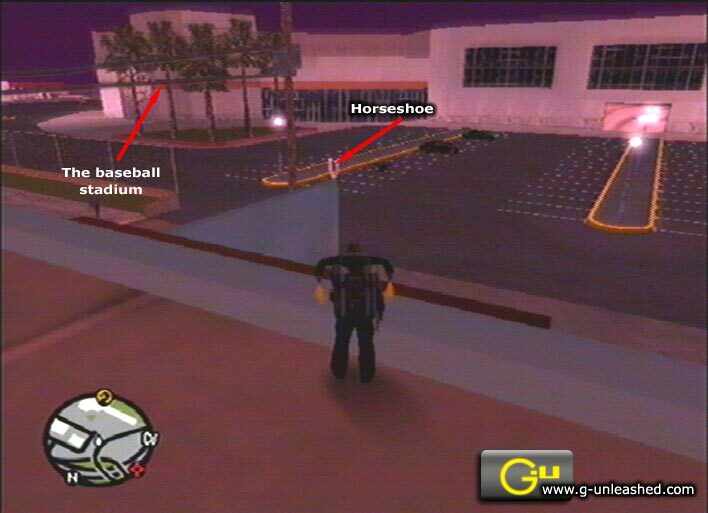 23 Location: - Find the large Bandits baseball stadium and at the north end where there is an entrance to the carpark, there is a horseshoe on top of a small blue wall. 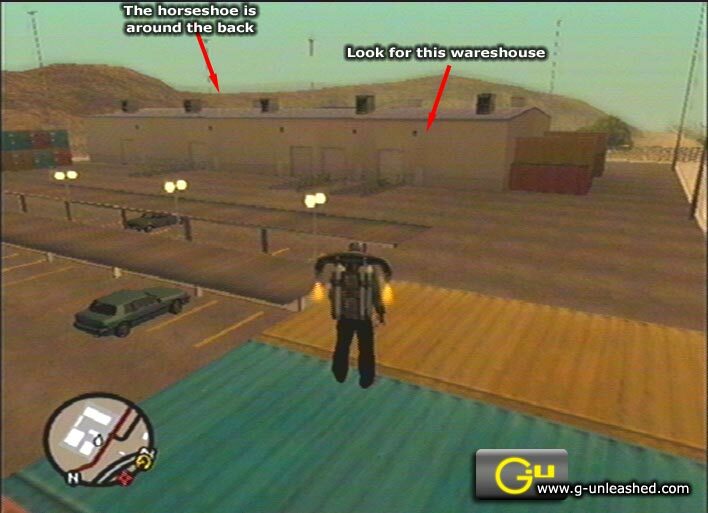 24 Location: - Find the wareshouse in redsands west that is surrounded in crates and yellow cranes. 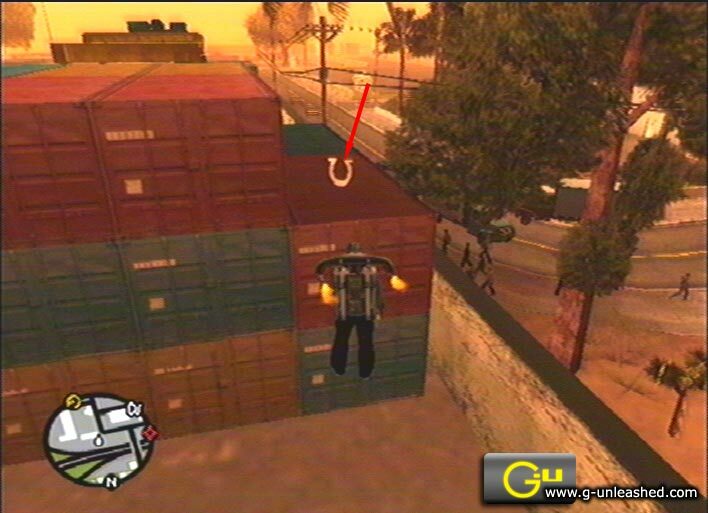 There is a horseshoe on the crates at the north west corner of the warehouse next to a tree. 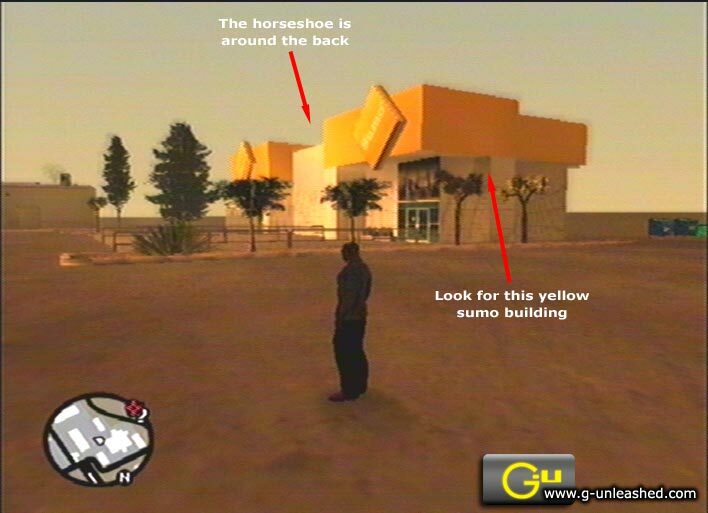 25 Location: - Find the steak house in redsands west. 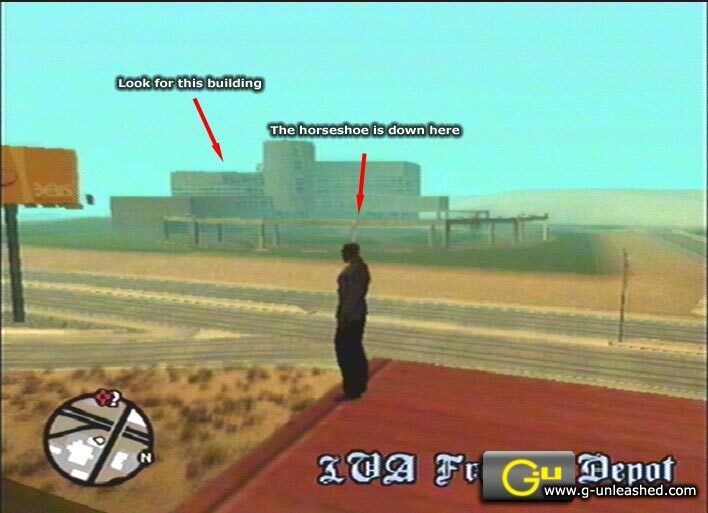 It's an easy to spot, red roofed building. 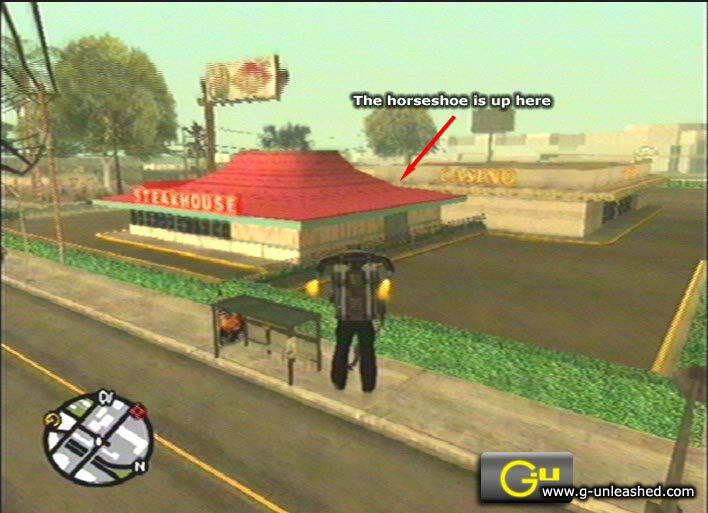 Behind it on the roof, next to a yellow casino sign, is the horseshoe.